I have been anxious to make and post this recipe for quinoa stuffed avocados. This recipe gives you the healthy fats found in avocados and protein from the quinoa. 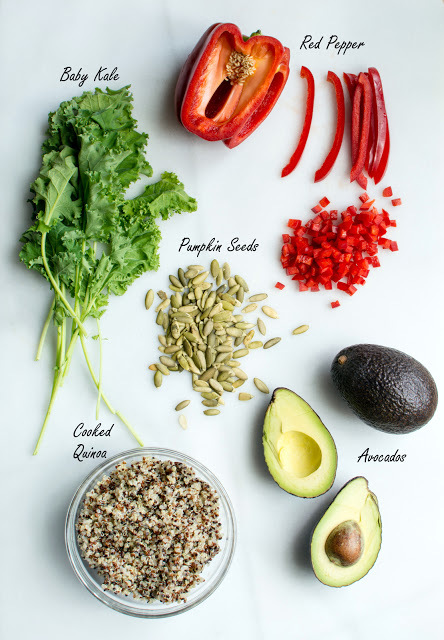 Along with kale, red peppers and a fabulous jalapeno lime dressing made from soaked and blended cashews, this recipe is healthy from the inside out. Quinoa stuffed avocados are one of my favorite lunches. As you know, I married a carnivore and I prefer eating vegetarian. He thinks the nutrition theory around kale is a conspiracy and avocados should be left on the tree. However, he really enjoys a plate of wild rockets (arugula) with a squeeze of lemon and EVOO. I’m afraid to tell him arugula has antioxidant benefits and detoxifying power and more. Baby steps. Baby steps. Someday I will let him know that I slip a bit of avocado into his smoothies and the parsley that I garnish his meals with is really curly leaf kale…or not. Place all of the stuffing ingredients in a small bowl. 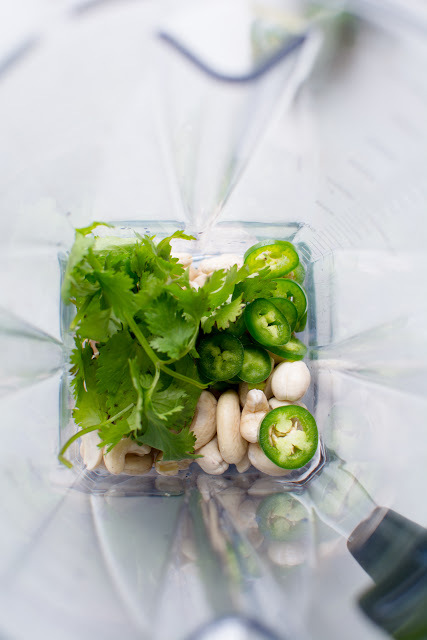 Place the cashews, jalapenos, cilantro, garlic, and lime juice in a blender. 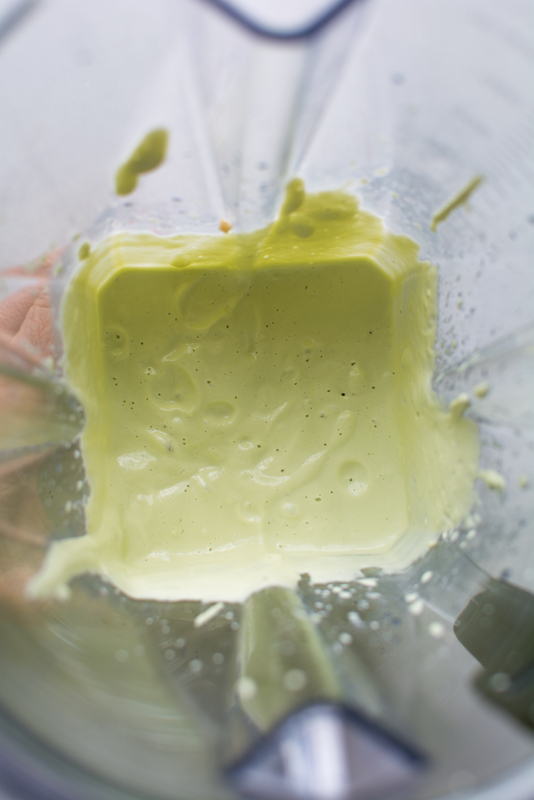 Blend until smooth while slowly drizzling in water to make a pourable, but not runny, consistency. Start with 1/4 cup water and add from there. Blend until very smooth and creamy. I was eating this with a spoon it was so delicious. Cut avocados in half and remove the pit. Carefully remove from outer shell. 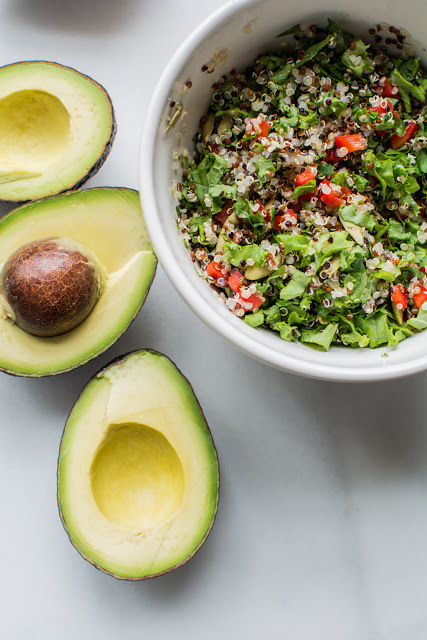 Fill the hallow part of the avocado with the quinoa mixture. Drizzle with cashew cream (I doused more than drizzled to be honest). 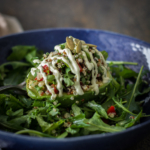 I like to serve the avocado on a bed of wild rockets (baby arugula) drizzled with olive oil and a squeeze of lemon, salt and pepper. 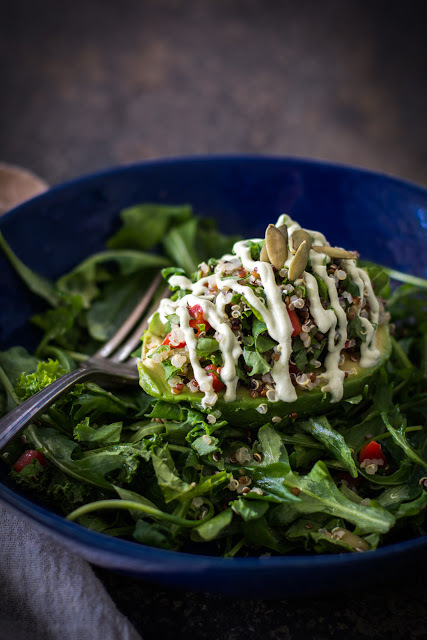 I love the peppery arugula combined with the stuffed avocado. 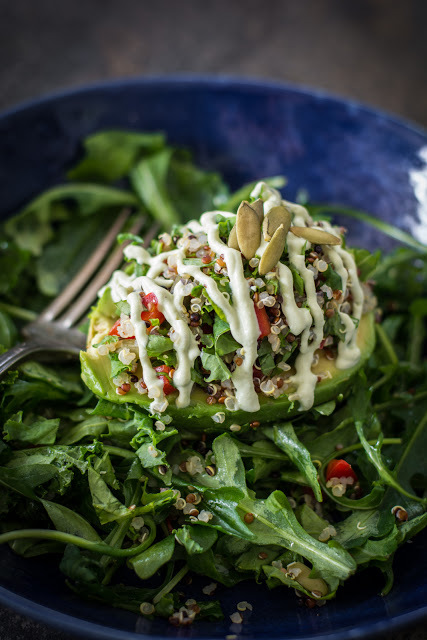 It creates the perfect bite and adds another healthy element that is full of flavor. 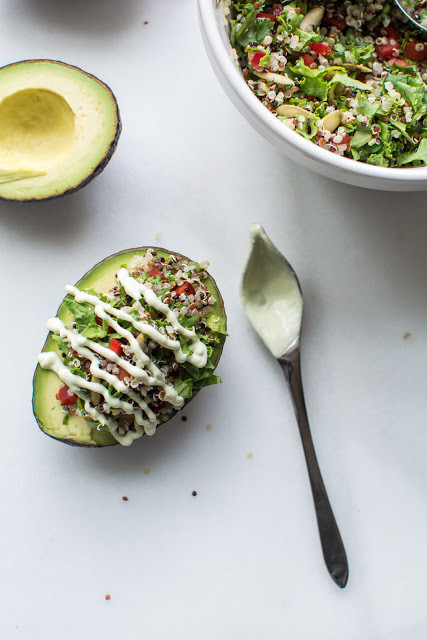 Fresh ripe avocados stuffed with quinoa drizzled with jalapeno lime cashew cream. 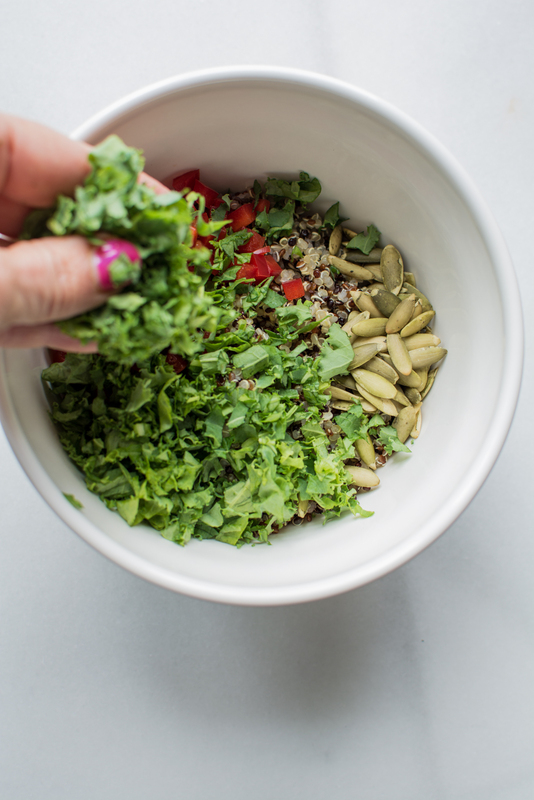 In a small bowl, stir together quinoa, red pepper, kale, and pumpkin seeds. Set aside. 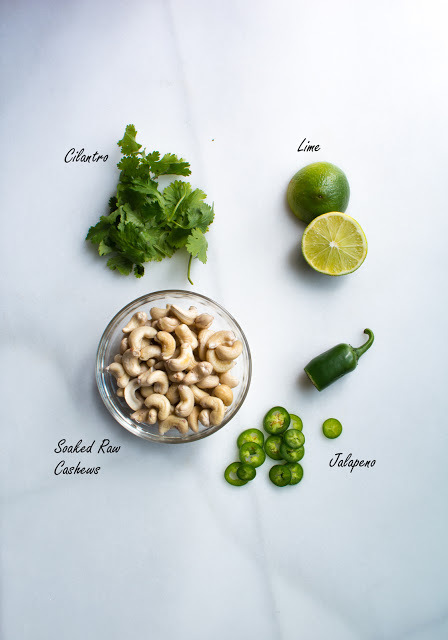 Make the cashew cream by blending cashews, cilantro, lime juice, garlic and salt. Slowly add water while blending until a creamy, smooth. Take care not to make the cream too thin. 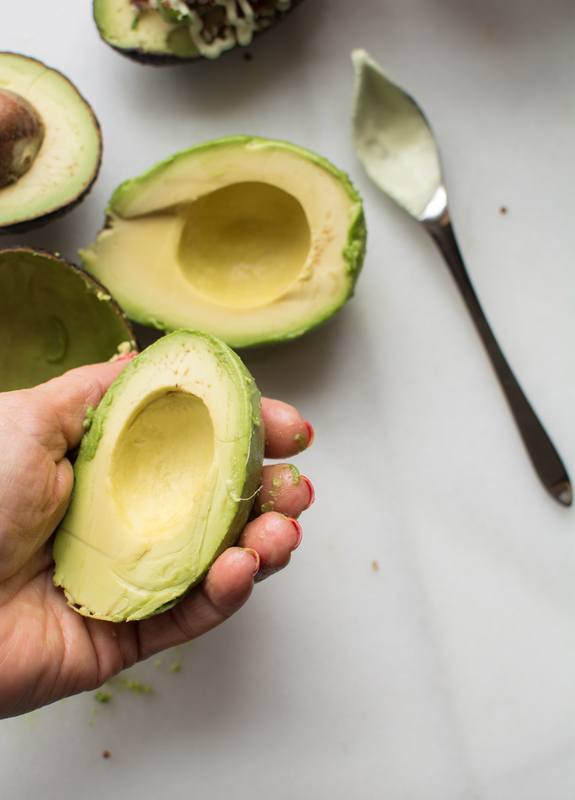 Cut avocados in half and remove the pit. 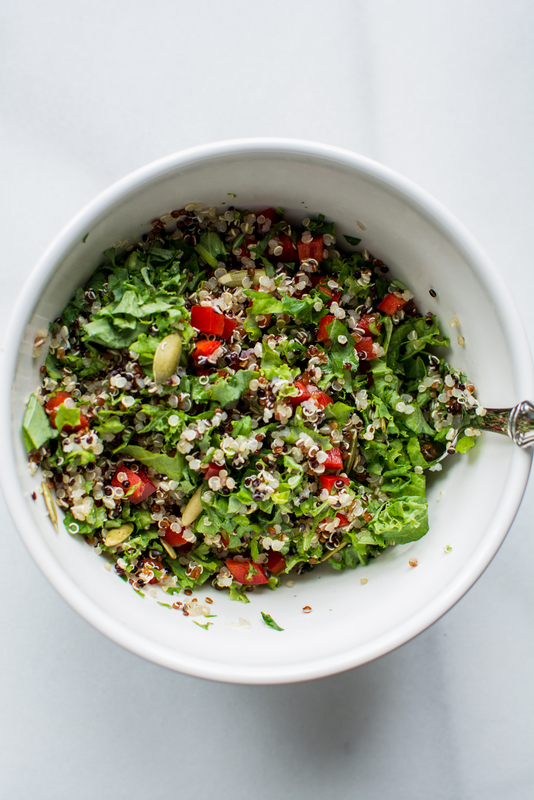 Fill with quinoa mixture and drizzle with cashew cream. 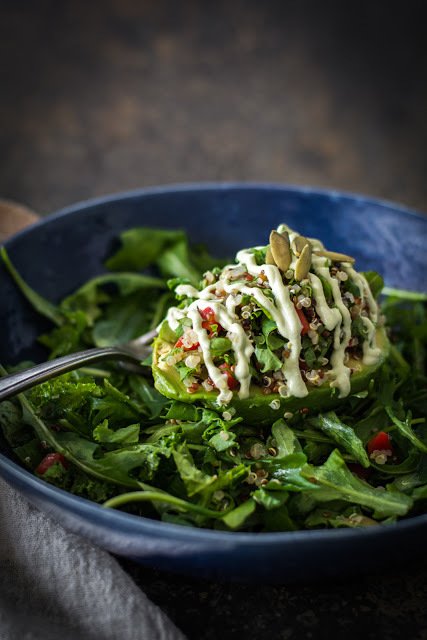 Serve on a bed of arugula that has been dressed with lemon juice and extra virgin olive oil. 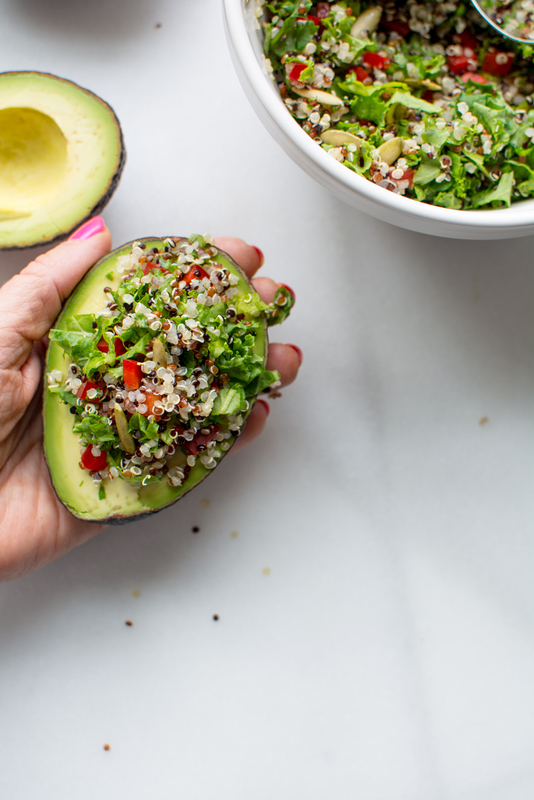 Serve immediately because you’d had for your avocados to turn brown. Makes 2-4 servings.